Private posts are a kind of locked post which can see or edit only by the authorized person or logged in user. It will restrict other to see the post content. Any user who has the permission to publish a post can make their post private and publish them. Administrator – An Administrator can create, edit, and delete any private post created by any user on a WP site. Editor – Can create, edit, and delete any private posts created by any user regardless you made those posts. Author – Can create, publish, edit, view and delete their private posts. But they cannot see or edit private posts created by other users. In this blog I am going to tell you how to create a private post in WordPress. Follow some easy steps and make your content private. First you need to create a post or edit the existing post. For this Go to Wp dashboard > Post > Add new. 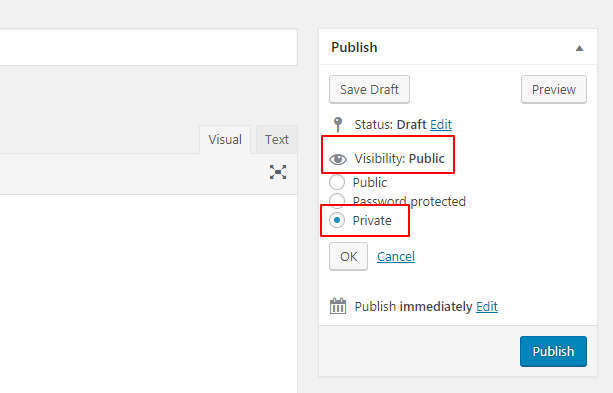 On the post editor, you need to click on the ‘Edit’ link next to the ‘Visibility’ option in ‘Publish’ meta box. Here You’ll see options to make a post Public, password protected, or private. Go ahead, select private and then click the OK button to continue. You can now continue editing the post or you can save/publish it. In this way you can easily make any of your post Private and for making it Password Protected. Do follow this Doc. For more information or query you can contact our support team at support forum.